Defenders continues to develop other peacemaking strategies, such as training Great Pyrenees as livestock guard dogs and supplying them to ranchers. The group also trains ranchers in how to use bean-bag or rubber bullets to scare wolves away; supplies electric fencing and other nonlethal anti-wolf devices; and supplies hay so some cattle are not released to pastures near wolf dens. "A lot of the ideas we get come from ranchers," and there is an increased feeling of trust, says Laverty. The National Wildlife Federation, as well as Defenders, is working on creating new strategies, such as wolf easements, which would allow those willing to pay for wolf habitat to connect with ranchers willing to sell some rights. Defenders also organized a group called Wolf Guardians - several dozen volunteers who gathered in Idaho last summer and this spring to camp out and hike with sheep and cattle herds, trying to keep them separated from wolves. Along with flashing brilliant strobe lights and shouting to scare wolves away from a herd of 2,000 sheep, says Julie Palmquist, a Wolf Guardian who came from Washington in April, "I was singing some show tunes - 'Annie Get Your Gun' and some 'Grease' tunes." She was trying to save the sheep, but even more, she was trying to save the Whitehawk Pack. "Nobody wanted to go there"
From the time wolves started showing up again naturally, the feds have been targeting those that prey on livestock, either knocking them down with tranquilizer darts and relocating them, or killing them. 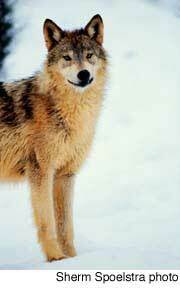 Ranchers who spot wolves killing livestock are also allowed to use lethal control. In this way, wolves are managed differently than most other endangered species. It's a political gesture to the locals, and even ranchers on middle ground like Soulen Hinson expect it. Nonlethal methods are typically tried first, including asking ranchers to allow room for wolves. But the more wolves show up on people's doorsteps, the more control actions are taken, so that by now, more than 120 wolves have been killed legally and more than 117 relocated. Eight packs have been wiped out. Wolf-haters doing illegal kills are still estimated to take a higher number than the official program does, although this year is shaping up to be a record year for official killing. "We've found we can do it surgically" - killing only the specific wolves that cause problems, Niemeyer says. "We've gotten very good at it." Wolf populations prove capable of absorbing such losses. Even if people killed 30 percent of a local wolf population, the population would continue to increase, Bangs says. To wipe out almost all wolves 70 years ago took a systematic regionwide war using poisons and baited traps, and that isn't happening now. The feds say they are bending over backwards to give wolves the benefit of the doubt in the face of their growing popularity. 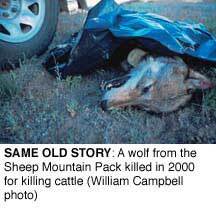 The Whitehawk pack had been in the public eye ever since it settled on the East Fork in spring of 2001 and began roving over the hill into the Sawtooth National Recreation Area. The Sawtooth NRA is 750,000 acres of sagebrush valley and three snowcapped ranges which include the Salmon River headwaters and more than 400 lakes - Idaho's most popular outdoor destination. But since coming into contact with ranch operations in the East Fork and the Sawtooth NRA, the wolves killed at least seven calves, 17 sheep and a guard dog, according to Niemeyer's records. One sheep was the 4-H project of a rancher's daughter, and had become a family pet. To discourage the pack from livestock, the feds killed only in increments: one wolf, then another two, another two, then another three, not including the final day. 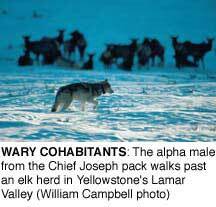 Toward the end, the pack was hanging out on the Challis National Forest hillside, scouting cattle that were in fenced pastures near ranch houses on the East Fork bottomland, day after day, night after night. 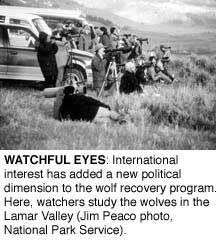 Niemeyer and Williamson, working with the Wolf Guardian volunteers, ranchers, and the Nez Perce tribal program, rigged anti-wolf devices all over the pastures, including a perimeter of Radio-Activated Guard boxes. When a radio-collared wolf approaches, the RAG boxes react to the collar and emit sounds of gunfire, glass breaking, interstate traffic, helicopter blades, galloping horses, men yelling. Almost every wolf in the pack was collared by then, so it was hard for them to sneak in without setting off the sound blasts. The men also fired many dozens of warning shots - explosive "cracker shells" from their shotguns, right into the rock formations where the wolves were hanging out. The volunteers camped out around the herds, making noise too. Still the wolves kept coming off the hill into the pastures. The 4-H sheep was "shredded" only a hundred yards from the family's house, Niemeyer says. Niemeyer saw no way out. The pack had a taste for livestock which was being passed from generation to generation, and there was nowhere to relocate the wolves where they wouldn't be on someone else's doorstep, he says. The ranch families in the area are tired of answering reporters' questions. But when Niemeyer told them he'd decided to eliminate the rest of the pack, he recalls, they reacted by saying, "Oh, no." "Nobody wanted to go there," Niemeyer says. 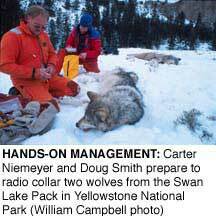 All along, the Fish and Wildlife Service's goal was to have 30 breeding wolf packs re-established for three consecutive years, spread equally between the three "recovery areas" - central Idaho, northwest Montana and Yellowstone (mostly within Wyoming). That goal will be accomplished by the end of this year, regional wolf manager Bangs says. Then the feds will move to take the gray wolves in the Northern Rockies off the Endangered Species List and turn management over to the three states, just as if wolves are no longer any more special than coyotes or elk. As a form of security, all three states have to put together wolf management plans, approved by the Fish and Wildlife Service, or wolves won't be taken off the federal list. There are plenty of uncertainties. Some conservation groups and the Nez Perce tribe support the idea of having the states take over wolf management, but are also watching the process closely. State wildlife managers have expertise, says France of the National Wildlife Federation, and this is how the Endangered Species Act is supposed to work.